Hello all! It’s been a while since my last article, so I wanted to come back and do something worth the wait. The other day I was thinking about one of my favorite formats to play casually: Chaos Draft. For those of you that are unfamiliar with the format, here is a brief rundown. 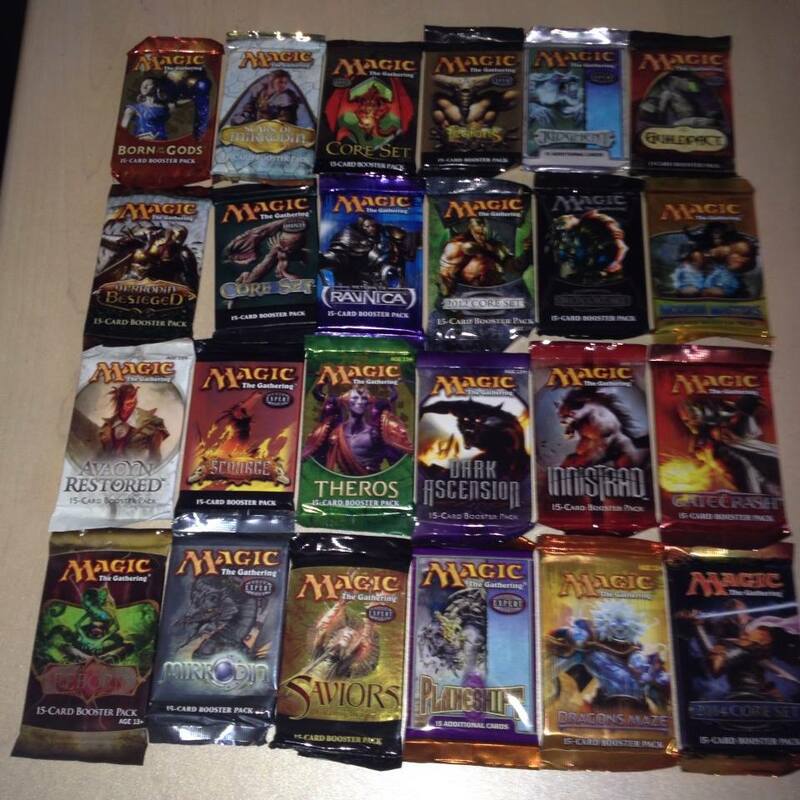 Each player at the table drafts with three packs, each of a different set. Preferably, this means that there are a total of 24 different sets to choose from. At its core it rewards reading signals, card evaluation and deck construction. In practice, it just leads to some of the most fun limited gameplay (with Cube of course being the only limited format I enjoy more). It is great to get a group of eight friends together and reminisce on old formats, and just play Magic in a way that feels incredibly fun. But you dear reader, want to know: what are the best packs to bring? Some Chaos Drafts I’ve done choose to draft the sets that you will open, others are bring-your-own. Regardless, some sets are better than others, and that I tackle here today. Before I begin, firstly I want to give a huge shout-out to Mike Linnemann (@VorthosMike on Twitter) for being a sanity check and inspiring this article. Seriously, if you are not following Mike on Twitter, you are missing out on some of the best Magic Art content available, arguably the best sock-wearer in MTG, and photos/videos of adorable dogs. Now then, some caveats about this article. Firstly, this is my personal tier list. You can feel free to disagree about specific sets, and respond and let me know on Twitter @MrLuBuFu . I'll start by giving some heuristics about how I define the best sets. Every set has insane bomb rares. Choosing a set because there is a chance of an Umezawa's Jitte or Pack Rat is not my mentality. I look to sets not only have a high chance of a powerful rare, but also to the commons and uncommons. The higher the likelihood of opening an insane card across all rarities dominates any single card (with one notable exception I cite below). So my most influential heuristic is how well you can open 'on average.' The more premiere removal at common or uncommon, the higher I personally rate it. Additionally, multicolor sets or those that value late-game mana-sinks tend to rate higher for me. Multicolor sets as an early pack can help shape the colors you have early on. Also, most Chaos draft games are slower than traditional draft, so having a late game engine often proves invaluable. With that in mind I also only cover 15 card packs, that are a non-silver border and in paper sets. Within each tier there is no particular order, just groupings with relative power levels between sets being close enough that there was no real need to differentiate. I will NOT be taking into account the financial value of each set. I will be only focusing on card quality. Lastly, I'll include any commentary or additional thoughts worth noting after the table. **While not released, the 'Collector's Booster' is known to contain 3 Rares/Mythics and is more likely to be in this tier. If Ravnica Allegiance is absolutely terrible, it should be downgraded. First of all, if you take a Mythic Edition or Prerelease Seeded booster to a Chaos draft, don't. The point of Chaos draft is to have fun, not necessarily to crush all your opponents underfoot by knowing you'll open a specific near-unbeatable card. Bringing a pack in which you know (at least some of the contents) takes away some of the fun. Masters sets are always in the conversation for being the best, between the insane reprints and the higher power level make it an easy choice for this category. Avacyn Restored was one of the worst sets I have ever drafted. However, the Soulbond mechanic is insane. This set is usually undervalued due to its history, but always provides great value for every color. New Phyrexia has tons of fantastic rares and mythics, but also the Phyrexian mana spells (Dismember being the strongest) that fit into any deck. The original Ravnica set is in a league of its own when it comes to the multicolor cards at common and uncommon. Between the Guildmages, Bouncelands, Signets and powerful removal, I always enjoy cracking open a Ravnica pack to start a Chaos draft. Last of the S Tier is Rise of the Eldrazi. With Level up as a fantastic late-game mechanic, and Totem Armor existing across the colors, you have a solid set of choices at the top level. The A Tier is primarily populated by sets that satisfy a specific criteria that proves very powerful in Chaos draft. These sets are either very strong multicolor sets (Invasion/Planeshift, Khans of Tarkir, Return to Ravnica/Gatecrash, Shadowmoor), sets with great removal at common/uncommon (M11, Conspiracy/Conspiracy: Take the Crown) or strong colorless or colored cards that can reward any draft (Mirrodin/Darksteel and Theros). Future Sight specifically has perhaps the best common ever printed: Sprout Swarm. This innocuous common is b-a-n-a-n-a-s. Future Sight, a small set differs from modern sets as it only has 60 commons. Running the hypergeometric calculator we get a 16.6% chance of opening Sprout Swarm. This is the only situation I choose that I pick a set mostly factoring in just this single card. A 1 in 6 chance of opening the best limited common, combined with a decently powered set helps put it in the A category. Theros may seem like an odd inclusion, especially since it famously had weak removal at the common and uncommon slot. (Remember, Voyage's End was a premiere common in that format!) However, this is easily offset by both the Monstrous creatures and the Bestow mechanic. Both offer a lot in Chaos draft, and combine that with the presence of Heroic (a great cross-set mechanic) and the power level is there. Astute readers may wonder why Fifth Edition is so high. First off, Banding exists across rarities. The mechanic is bonkers, as long as you know how it works. Additionally, many of the rarities match with Alpha/Beta, so that means Fireball, Pestilence, and Disintegrate are all commons. I'd be remiss if I did not mention the fact that Pack Rat is a rare in Return to Ravnica, and the remainder of the set is fantastic as a multicolor set, so snapping this up in Chaos is a solid gameplan. While I intended to have brackets explicitly on each letter grade, I found that a few sets are in a bracket just below the A tier. You still are happy with any of these sets, and one can make an argument to bump them either up or down. Dominaria, Innistrad and M12 all provide solid cards that can fit in most decks, as long as you disregard the cards that depend too much on synergies (UR wizards,Burning Vengeance,Tribal cards from Lorwyn, etc.). The whole of Alara is a great multicolor block, and can help guide your draft early on. Ninth Edition feels like a gamble. There are many insane uncommons, but the commons and the rares are comparatively weaker. The sets in the B tier are all what I call 'above average.' You are certainly likely to pick up a decently powerful card, but the average ceiling is just a bit lower. (Again: the key word here is 'average'). Certainly these sets are better than merely playable. If you disregard the slivers in Time Spiral, there are lots of power commons, and are almost guaranteed to get something relevant. Amonkhet can be a powerful set if you disregard the tribal synergies. (Although, there are certainly enough Zombies spanning Magic history that there some combos that can be made.) Cycling, Embalm and Aftermath all play very well. This set is the closest to the A-/B+ tier in this category, and I certainly may be underrating it. Both Guildpact and Dissension have some powerful commons, but they are localized to only a few color pairs: UR and BW in Guildpact: UW and UG in Dissension. (Don't get me wrong, those pairs just have more depth in a Limited setting). Onslaught has plenty of powerful morphs and removal, so it ovften gets underrated. Much like how most set reviews have lots of cards in the C category, I also have a higher concentration of sets in the C tier. These all certainly have decent removal in the common slot, and that certainly will help any limited deck (and will likely be the pick, outside of a powerful rare or mythic). Kaladesh is fresh in many player's minds as an insanely powerful set, but the energy mechanic is just terrible in Chaos draft. Snap up the Renegade Freighter and enjoy the ability to play it in any deck. Both Dragons of Tarkir and Dragon's Maze suffer, not only by having 'Dragon' in their name, but also as sets with a very high ceiling (lots of powerful rares) but lackluster commons and uncommons. (I'm looking at you, Ravnica Cluestones). Worldwake often is higher in most lists, due to the value found in the set. Yes, if you open a Jace, the Mind Sculptor you deserve to do a little jig, but the rest of the set lacks consistent power. Most sets in the D tier are not necessarily bad limited formats. Often times the one weakness is too much synergy between the block, and almost none in Chaos draft. Let's break down some of the major offenders. Here we have it, the worst of the worst. Scars of Mirrodin block with always have a special place in my heart, as it is when I first started attending FNM and drafting. Alas, with such narrow mechanics as Metalcraft, Infect, Proliferate and Artifact matters cards, a large swath of this set is terrible. Yes, mana myr can be solid, and bombs are there, but given all the sets to choose from, you'd be smart to stay away. Coldsnap has a similar issue, as Snow mana does not play well in Chaos draft. Combine that with Ripple (good luck getting multiple copies), Recover (a very weak mechanic) and Rune Snag cycle, you just don't have a good likelihood of opening something relevant. Aether Revolt suffers like Kaladesh: Energy doesn't play well. Combine that with Improvise (hard to get many good and cheap artifacts) and Revolt (which becomes harder to trigger) and the set is overall weak. Yes, you can pick up a powerful vehicle, but overall the set is terrible. Lastly, the rare Starter 1999 pack. If someone brings this to a Chaos draft, you can assume that they have a heart of gold, and a terrible pick. Thank you all for reading, I look forward to hearing all of your comments and criticisms. MTG_YoungMage and his family need some help. In the spirit of this giving season, we ask that you consider making a contribution to this GoFundMe. Lord Tupperware's take on our upcoming limited format. Some interactions you might not want to miss!